I missed my usual summer assessment this year. My main excuse is that it was scheduled for the first two weeks of July, when I was out in China. As it stands, since my last assessment (April 21st, 2015), I have covered a variety of religious beliefs in support of environmental issues with an emphasis on climate change; this included Judaism, Islam, Pope Francis’ declaration on climate change by way of his recent Encyclical, and the environmental beliefs at the core of Taoism. Most of these entries came in the form of guest blogs written by young people who practice these various religions and are interested in the world around them. I also looked at global carbon taxation efforts and reactions to the recent sharp drop in the global price of fossil fuels. In preparation for the incredibly important upcoming global meeting in Paris scheduled for December this year, I also discussed aspects of progress in the transition to more sustainable energy mixes in countries such as Canada (British Columbia), the US (Texas), and China – following my July trip. Our school year started about two weeks ago. My course on climate change this semester will focus on the Paris meeting, with this blog serving as a resource for the students. These topics will probably continue until the end of the year. They will be fueled by two very important visitors: President Xi Jinping from China and Pope Francis. Both are scheduled to arrive on September 22nd. President Xi will depart on September 28 and Pope Francis will leave one day earlier. The corresponding arrival dates are not accidental. Since these visits also coincide with the 70th session of the UN General Assembly, many other world leaders will show up to discuss pressing global affairs. There is expected to be a strong emphasis on the global refugee crisis; an estimated 60 million people around the world have already fled their homes because of wars – most of which have been triggered by government collapse. Climate change and the preparations for Paris’s December conference will also be at the top of the agenda. Ban Ki-moon, the Secretary General of the United Nations, will prompt the assembled leaders to try to provide global solutions to these impending global problems, at a time when such solutions are desperately needed. My interest in these issues is not restricted to climate change. I was a child refugee after WWII and the fate of today’s millions of refugees – together with the world’s attitude and efforts to ensure their safety is of great concern to me. Of course, I created this blog specifically to tackle climate change, but climate change is a global issue with vast repercussions (including these refugee crises) that requires global solutions. Under current global governance systems it is very difficult to implement and enforce global solutions. The refugee problem suffers from this lack of administrative force. The United Nations is certainly an organization that can tackle global problems such as the refugee issue and climate change, but it is not the only organization that can try to do the job. Major organized religions can also effectively influence solutions for such issues. In this blog I will mention the Catholic Church and Islam. 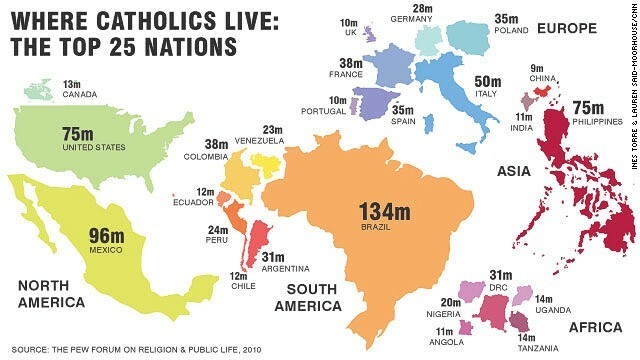 The total number of Catholics worldwide is about 1.3 billion. When Pope Francis addresses the United Nations and several other US venues, chances are good that more than 1 billion people will listen. Pope Francis doesn’t have the enforcing power of a state, but for most of Catholics around the world he speaks with a higher command and believers will listen. 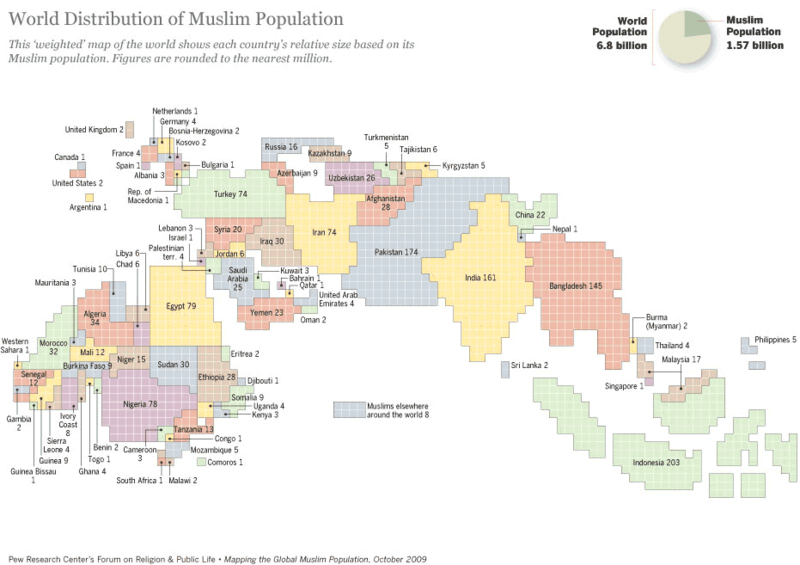 Figure 2, likewise shows the distribution of Muslims around the world, but Muslims don’t have a single authority similar to the Catholic Church. In fact, militant Muslim organizations are responsible for much of the unrest around the world, and have been the main trigger behind the massive refugee crisis. This is obviously not an all-inclusive list, and the real numbers – including all of the affiliates in various countries is much larger; still, it represents a very small percentage of the Muslim population. Bear in mind that the vast majority of the victims of the atrocities that these terrorist organizations initiate are Muslim as well. Those who manage to escape such regimes comprise many of the aforementioned refugees. The point here is that Islam itself, as a global organized religion is not the enemy. It can actually provide great tools to counter the global instability that its more militant factions have brought about. A few weeks ago (August 17 & 18th) an “International Islamic Climate Change Symposium” was held in Istanbul, Turkey. A group of top academics has been engaged in drafting an “Islamic Declaration on Climate Change” and the initial draft has been circulated widely for consultation. The symposium will be an experts’ meeting convened to seek broad unity and ownership from the Islamic community around the Declaration, and to further discuss the amplification of messages and mobilization of various actors and groups around COP 21 and in the future. In attendance will be senior international development policy makers, leaders of faith groups, academics, and other experts. This symposium shall also provide opportunities to connect with leaders from other faiths as well as secular organisations, and promote inter-faith and cross-movement cooperation around aligned and joint messages. It will moreover highlight the future role and contribution of Muslims to the climate movement, and present ample communications opportunities, the aim being to secure high level representation from the diversity of actors mentioned above. I have asked Sofia Ahsanuddin, the student that wrote the June 16th guest blog about Islam’s position on environmental issues to follow up on the reactions to this symposium and provide us with another guest blog on the topic. Fall 2015 Assessment: Since my Spring Assessment, I have gained 42 followers on Twitter (bringing my total to 332). I also had 698 profile visits, 48 mentions, 58 retweets and 50.6K tweet impressions. This is all readily accessible information. On Facebook, in the same time period, my page got an additional 30,028 impressions from 23,579 users. On my blog itself I’m happy to report that I’ve had had 690 visits from 261 unique computers, 439 of them new visitors. To those of you reading, I thank you and (as always) welcome your comments. This entry was posted in Climate Change and tagged Al-Quaeda, assessment, Ban-Ki Moon, Boko Haram, Catholic Church, China, Christian, Clean Energy, Climate Change, Conference, encyclical, Energy, Environment, Global Warming, ISIL, Islam, Istanbul, Jew, Judaism, muslim, Papal Encyclical, Paris, Pope, Pope Francis, Power, refugee, religion, Sustainability, symposium, Taliban, Taoism, terrorist, Turkey, UN, United Nations, World Population. Bookmark the permalink.